Our home is the perfect retreat and has some of the best views on Lake Arrowhead. Not only do you have a great view on two decks you also have your own dock and deep water to dive into and enjoy. 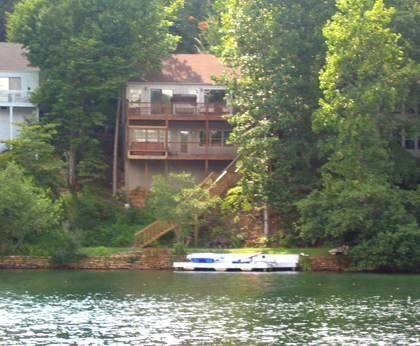 We have been renting this lake house for over 10 years now and we know what renters want. The house has a total of four bedrooms with three new king size beds. One of the four bedrooms has a bunk bed for the kids. The house comes with two small living rooms, one up and one down, with their own flat screen TV with Comcast Cable in each. The fully stocked kitchen is open to the top living room and is perfect for family gatherings around the granite countertop. We provide almost everything you need from bath soap to laundry soap. This lake house will accommodate eight people comfortably, but can sleep ten. We also rent our Manitou 22 foot 115 HP pontoon boat for a super low rate of $850 per week or $450 for the weekend. Most pontoon boats of this type rent for $850 a day on lakes here in Georgia. We have an assortment of life jackets and keep a couple pull behind rafts to tow behind the boat. We only rent to guests staying at the house. Amenities: The lake house has 4 bedrooms (3 king size beds, 1 bunk bed, 3 bathrooms, 2 sitting areas, 2 decks, private dock (on the water of course), gas grill, 6 person hot tub, complete kitchen (with pots & pans, dishes, utensils, coffee maker, etc. ), linens and towels, laundry facilities. Free local and long distance calling inside the USA. Broadband internet provided free. Lake Arrowhead is a private community with a 540 acre spring feed lake. This is Georgia's largest private lake. The lake rarely fluctuates and is one of the cleanest lakes in Georgia. The community offers a wide range of activities including 18 hole Golf course, public swimming pool with life guards, six lighted tennis courts, fishing, clean and clear lake perfect for swimming. All amenities are available to our guests within Lake Arrowhead. All restaurants are located 20 minutes away in Canton. Being only 1 hour north of Atlanta, you are a short distance away from White Water (30 minutes), Six Flags (45 minutes), Zoo Atlanta (45 minutes), GA Aquarium (45 minutes), Stone Mountain (60 minutes), and major sports arenas. Lake Arrowhead Golf Club: Often rated as one of the nicest courses in North Georgia, the Lake Arrowhead course is surrounded by Mountain that add to the experience of playing such a beautiful course. With the 540 acre private lake as a back drop all your cares will melt away as you play our challenging course. We are a family of four and love the lake life! We own this house to help keep our family involved in the same extracurricular activities....boating, swimming, fishing, and just sitting on the deck and watching the sun and moon come up over the mountains. We are very blessed to own this house and love to share the joy with others. This lake house is close to Marietta (which is where we live) Lakepoint Sports (our son is a wakeboard instructor), and Atlanta. The water level rarely fluctuates, even in a drought, and the water is crystal clean. Lake Arrowhead is a private lake to which you must have access to fish. That is why the lake is so full of large fish. We just love the view from the deck and the deep super clean water in the lake. When looking for lake property we learned you have two choices for lake property. Deep water but the house will be up off the water OR house on the water but a shallow lake. We chose deep water and high view. We also love the fact the house sits on the no wake area of the lake. You may not care when looking for a lake if your in the no wake area until you try and swim off the dock or better yet when your kids are swimming. With no wake the boats slowly drive by and you don't worry as much about the kids swimming off the dock. Lake Arrowhead is a spillover lake and it is also spring feed. The water level has only dropped about a foot in the years we have owned the house. I think the water is about 10 feet deep off the end of the dock. I will drink a glass of water from the lake. Would you do that from any other lake in Georgia. No septic tanks. No water runoff from farms. No streams feeding the lake that come from developments. This place is heaven on earth. Private clean lake that is less than a hour from Atlanta. The area we are located is a NO WAKE area so you can safely swim and not worry about speeding boats. New dock with clean deep lake water. Jump into one of the cleanest lakes in the south. Private dock with ladder. Jump right in, over 15 feet deep at dock, water is warm and crystal clean. Only drops about one foot during droughts. Swim and fish from dock. Deep water dock in the no wake area. New kitchen completed in 2009. Cable TV in both living rooms. 42 inch TV in the upper living room. 50 inch TV in the downstairs living room. Currently we have two canoes, one kayak, one paddle board and floats for the lake. Some life jackets are provided. You have some canoes, one kayak, paddle board, pull behind raft, all at the house ready for you. Bring your rackets and balls. We have multiple courts near the swimming pool about 5 minutes from the house. You have full access to Lake Arrowhead Golf Course. Top of the line COLEMAN HOT TUB SPA - private and overlooking the lake. We allow smoking only on the top and bottom decks. Because of my sons allergies we do not allow smoking inside the house at all. We also are not able to have pets of any kind. We have a paddle boat on the dock that seats 5 people. Perfect for a family reunion. Our family enjoy canoeing and the pedaling boat. Weather was good not too cold or hot. We where able to travel to Chattanooga, TN and Maggie Valley, NC for ski at Cataloochee ski Resort. Easy access to different attractions. The Sail Away is very clean and comfortable. It’s roomy and family friendly. Our family stayed here for one of our daughter’s weddings. We had 4 couples and their children staying. There was more than enough room for all of us. It was early fall so we were not able to enjoy the water activities. But the colorful leaves and fireplace were a huge hit!! The owners supply everything you could have possibly forgotten. We can’t wait to come back in the summer!!! Awesome place. We enjoyed our stay. Our daughter was getting married and we lived an hour and a halfaway. The Sail Away was perfect for the occasion. I was able to have the whole family under one roof with enough room to accommodate everyone comfortably. With the wedding a success and our daughter happily married, we took the day after to relax. Some did nothing and enjoyed the veiw from the deck, some took advantage of the hot tub, while the more active fished from the dock, and paddled around the lake in the canoes. It was amazing and has inspired us to take a family vacation next year. Who knows we may be back next year. Thank you. This place is really special. Thanks and we hope to rent again sometime. We had a great stay at this property. The house was well stocked with everything you could possibly need. Lots of water "toys" and life jackets available. The hot tub was a perfect way to relax and unwind. Everyone loved the video arcade game!! I would definitely rent this property again. Owners were very accommodating and answered emails promptly. This is the second year we have rented this home for our family reunion - and it's great! We love Lake Arrowhead - it's such a quiet, clean lake. The location of the house is perfect - it's in the no wake area, but it's close enough to the main lake so it doesn't take too long to get out there. The house is clean and well maintained, the kitchen is well equipped, and there was plenty of room for us all to spread out. We spent a lot of time on the back deck enjoying the view. Thank you for letting us stay again - we really enjoyed it! Attractions less than 90 minutes. White Water, Six Flags over GA, Georgia Aquarium, Stone Mountain Park, Hang Gliding, Sky Diving, Dahlonega Gold Mine, White Water Rafting, Tubing, Rock City, and more. The Highlands Golf Course at Lake Arrowhead is NOW open for play! Nine newly renovated holes are now available. All 18 holes are open and ready for you. Golf: The Highlands Course at Lake Arrowhead is now OPEN for play! Ski: Water Ski or pull a raft behind the New Manitou Pontoon boat.